Regular readers of our blogs, must have seen that the total Nautical Miles of 20.883 are not in line with the 16.673 in our last blog. I have made some errors during this trip in my calculations and omitted moreover the legs Budel-Locarno-Budel. However we should all be content, it were mistakes in calculations for a blog and not for navigation purposes. 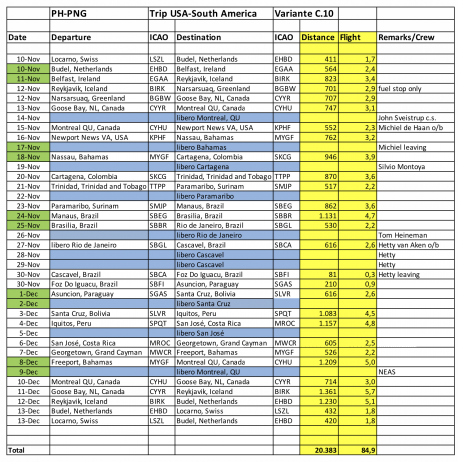 I am adding here below a revised schedule, based upon the actual distances, actual airports called and actual dates. It would take me too much time to make these changes in all the blogs on this webpage, but the corrected blogs will appear in the printed blog book. The JOURNAL I promised you on 4 December will not appear. We left Sophie in Amsterdam and we departed from Budel to Locarno with Niels Witte on board to join me on our return flight from Locarno to Budel on the same day. En toen kwam er een olifant met een hele lange snuit en die blies het hele verhaaltje uit.